MR. SMITH, what’s up brother? My name is TIMOTHY DRIGGERS. 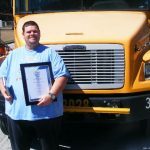 I am the school bus driver in Hillsborugh County Florida that received the Celebrate Literacy award. This award has never been given out to a non-instructional employee in United States. A lot of awards followed. All because someone left a book on my bus one day and I decided to read it to the kids. When I arrive at their school [Lomax] I have about 25 minutes before they leave on the bus. I graduated in 1984 and went straight to work. Up to about 3 years ago I never even thought about reading a book. In those 3 years I have read about 40 books–a lot of them to the kids, a lot for myself. One of my favorites was Peak. I hardly ever get out of the county, but I can say I’ve been to the top of the world through your writing. Thank you for that. Now Roland, words can’t say how much I am hungering for the book to follow Tentacles. You are an amazing writer. Is there a way to find out when this book might be out my friend? Down here in Florida watching college football today and resting. Happy holiday to you and a happy new year. Sorry if this was to long. Thanks Timothy! You made my weekend. And congratulations on the Celebrate Literacy Award! Keep reading. To answer your question about the third Cryptid Hunters book… I’m working on it right now, which means it will be awhile before it’s out. Stay tuned. I’ll post updates here and on my Face Book Fan Page. Here’s an article from the St. Petersburg Times about Timothy’s Award. What a great email. This is a great story from Timothy. I’d like to reach out and give him a big hug! Hi, Mr. Smith! I’m emailing for a student in my 3rd grade class in San Diego. Our library just received many new books, and my kids are excited to check them out. We were not familiar with your “The 39 Clues” series. One of the students has Book 4 of “Cahills vs. Vespers (Shatterproof).” We can’t figure out why the page numbers are not in order. Once it reaches pg. 38, it goes back to pg. 11, 14, 15, 20, 13, 15, 12, and 5. Then it continues with page 47 to the end of the book. Is this intentional and is it one of those books where they choose where the story goes? Or could it possibly be am error from the publisher? Thanks for solving this mystery for us!! !